The event was the Fourth of July 1876 ceremonies held in Santa Rosa. 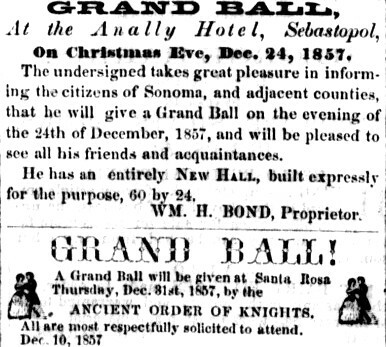 “At an early hour the streets were thronged with carriages, horsemen and well dressed and happy looking men and women,” reported the town’s Sonoma Democrat. The parade formed on Third street; near the head was the Santa Rosa Brass Band and judges and dignitaries in carriages (including Bear Flag veterans with their famous flag). In the parade were also carts or displays representing local businesses, among them a wagon loaded with coal from the Taylor Mountain Coal Mine. “The procession marched through the principal streets which were gaily decorated with flags,” the paper continued, before returning to the grandstand on Santa Rosa’s plaza. It’s a fun story and often retold – except none of it happened quite that way. This was not the debut of the “Squeduncques” at a Santa Rosa Fourth of July celebration but at least their third appearance. Their “comical uniforms” were mentioned in a review of their 1874 showing so yeah, it’s probably safe to assume they were also dressed up two years later, although nothing about it was mentioned. Those are quibbling points, tho. Nor did General Vallejo even speak at the event. As described in the paper, he sat onstage as his speech was read by Charles E. Pickett, a well-known (and somewhat notorious) orator.1 The Sonoma Democrat didn’t indicate whether it was in Spanish or English although it was likely the latter, as the paper commented the speech “was listened to with deep attention by all.” The entire address in English appeared in the Democrat the following week. 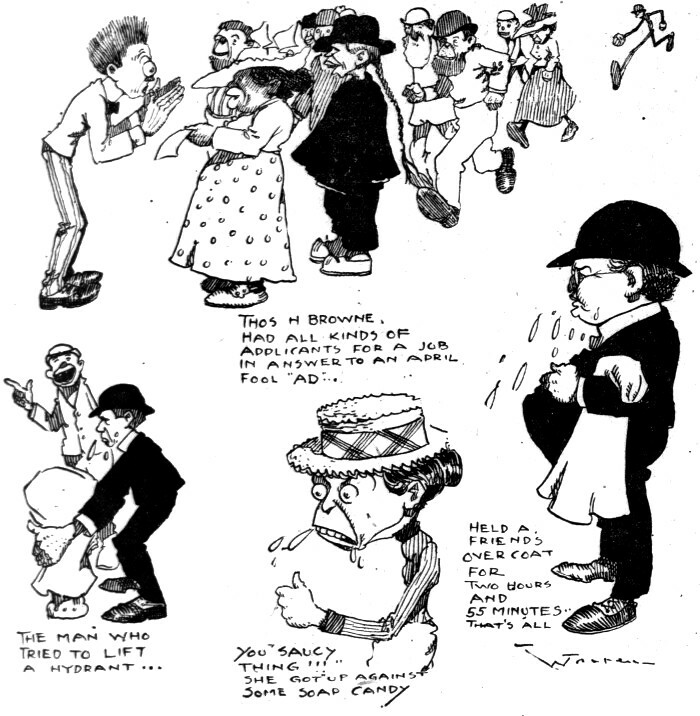 The Fantastics – sometimes “Fantasticals” – began in Colonial times (and can even be traced farther back to British mumming) were mainly young men dressing up, sometimes in women’s clothes or wearing blackface while noisily mocking propriety and figures of authority. Think of it as trick-or-treating for adults, not children, and it happened at Thanksgiving or Christmas or any other holiday except Hallowe’en. Also: They wanted you to give them booze, not candy. More about the origins can be read here. Needless to say, our more sober ancestors were not approving of their young men carousing drunkenly in costumes four or five times a year. (Did I mention firing guns in the air was also a big part of the custom?) 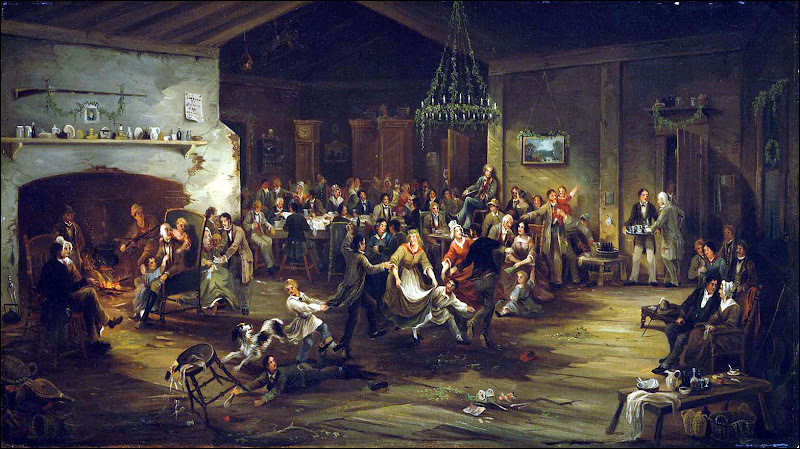 Apparently starting in the 1830s, restrictions began to be imposed limiting the partying to the Fourth of July and requiring the costumed revelers be enrolled in some sort of organized group. The earliest example of this I can find is an ad in the June 27, 1839 Baltimore Sun that calls for members of the “Eagle Fantastical Club” to attend a meeting for the upcoming parade. The Squeedunk tradition continued in Sonoma county for decades, spreading to Sebastopol, Healdsburg, Cloverdale and other communities. 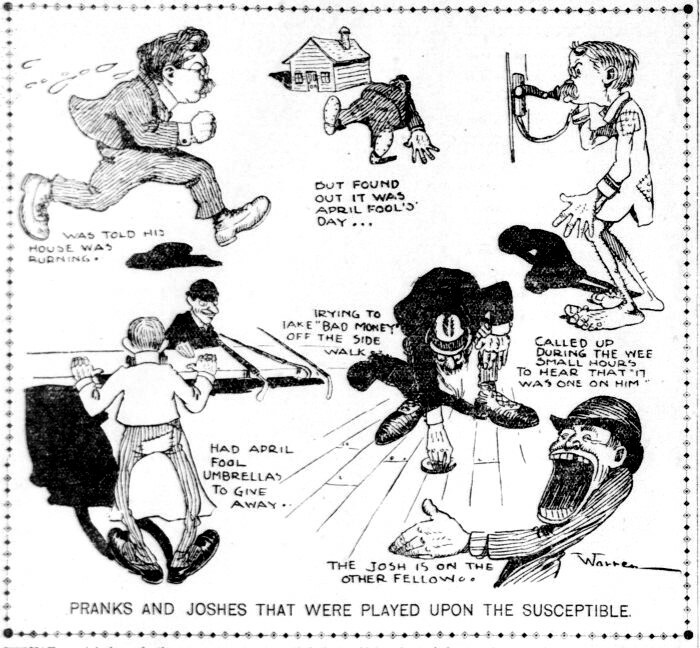 The last great ballyhoo in Santa Rosa was in 1908 (see “SQUEEDUNKS ON PARADE“) but attempts at revivals popped up occasionally in later years. How sad to have lost the custom of celebrating our old bums, lunch eaters, and scalawags. 1 Charles E. Pickett was then 56 years old and well known as an eccentric who claimed his profession as “philosopher.” Despite a complete lack of legal training he was long a gadfly concerning the state supreme court, insisting the system of selecting judges was corrupt because the governor could appoint someone to fill a vacant seat until the end of the six year term of office. Thus a justice who was elected in 1870 and died or resigned the following year would be replaced with a politcal appointee until 1876, despite the opportunity for voters to choose a new justice in two general elections during that span of time. (Or at least, that’s my reading of the confusing rules – see more details here.) In Pickett’s view this meant the entire court should be impeached and as a new session began in August, 1874, he stormed the bench during opening ceremonies and took a seat himself. An uproar ensued and he was ejected, fined, and served over a year in jail for his unusual contempt of court. 2 Squeedunk (usually spelled Squedunk) came to be used as a joke town name, similar as Podunk, Skunktown and many others. Sometimes it was meant as the name of a place where backwoods yokels lived, othertimes it was just the name of a a hypothetical town. See: H. L. Mencken, The American Language, 1936. In the early 1870s, however, a squedunk was the name of a popular homemade noisemaker with a teeth-rattling sound created by drawing a violin bow or a waxed string on the rim of a tin can. Thus by calling themselves Squeedunks, the joke could have been either proclaiming themselves to be proudly “backwards country folk” or intending to be really, really annoying. Or both. The Squeduncques, a distinguished band of imps, devils, patriotic hoodlums and screachers, will parade the streets of Santa Ross on the Fourth of July. At the close of the oration Mayor Neblett announced that Gen. M. G. Vallejo had arrived on the morning of the fourth in Santa Rosa, having concluded to accept the invitation of the committee sent from Santa Rosa some days previously to invite him to deliver his historical address here, the managers of the Sonoma valley celebration having concluded to omit this feature from their published programme. 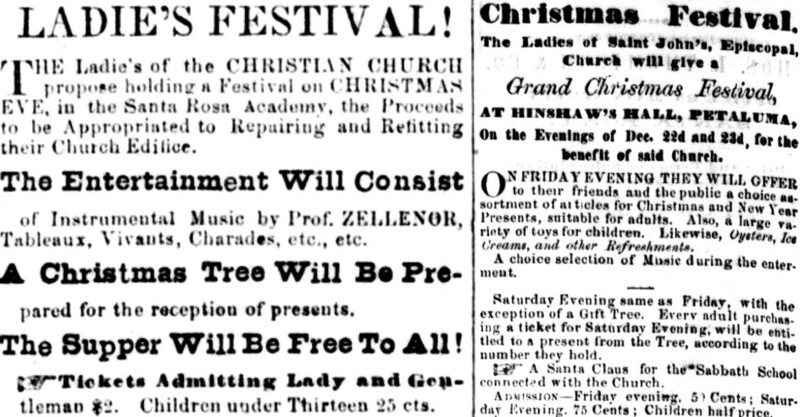 The large audience hailed the General’s advent [illegible line of microfilm] with much enthusiasm. His well prepared history of the early settlements of the north side of the bay of San Francisco, and other incidents, was read by Mr. Chas. E. Pickett of the city of San Francisco, a pioneer of 1842, was listened to with deep attention by all. At his close three cheers for the General were called for and loudly given. This instructive, graphic and exact historical sketch, with characteristic comments by the author, will appear in the weekly issue of the DEMOCRAT. For many sleepless nights we have watched the bursting character of your patriotic bosom. We have seen it swell–heave and pad out with a grandeur which few bosoms can ever expect to reach. We are overflowing with gratitude but we can beer it all times. In order to make a proper showing of our inside feelings towards you, we present you with this beautiful sword. In other hands a club of this character would prove a very dangerous weapon. May you never entertain suicidal notions, for it won’t do to get reckless in order to provide free rides for old bums. Take it–Hang it up in the cellar where it can never rust, nor become mortified by bad use. And when your beaming head shall have assumed the radiance of a white-wash bucket, and when telegraphing shall have been supplanted by the lightning speed of Fortson’s street railroad, may you be rolled up in the emblems of eternal ease, surrounded by limburger cheese, and beer, and with this shining blade buckled to your majestic form may you march on to Fame and Glory, and find sweet repose in the happy hunting grounds of our Honorable Order. Why, Fellow Squedunques, is all this grand parade? Why all this vast assemblage of old bums, lunch eaters, and scalawags? Why all this tootin of horns banging of drums and squallin of “nest hiders?” It is, my fellows in iniqnity, to remind us of the fact that he who fit and run away has lived to fite another day. I ask you, Squedunques, are we not great in our greatness? Compare us today with Santa Rosa one hundred years ago. Look at these sombrero oaks, which within the hundred years from little acorns grow. Look at these beautiful maidens who a hundred years ago were clad in homespun linsey and tow linen. How are they now? Wrapped in silk and satins from the Injins, bedecked with laces from Crapean and Deutchland adorned with gold and silver from Som Evaders, pinned back till the hump raises on their backs equal to the Camelias of Arabia. Look at our farms where a hundred years ago, notight was heard but the war whoop of the Digger and the wild screech of the Coyote, now blossoming and blooming with mustard and dog fennel. Look at our bankin institutions. There’s the Anti Roses Bank where every Squedunque can borrow all he wants, if he leaves two dollars in the place of every one he borries. Then there’s the Shavings Bank with millions in it saving up for the widders and orphins of deceased Squedunques, to be divided a hundred years from to-day. Then there’s Long Pillars’ Pharaoh bank that declares a divy every night, if you only copper the loser and go straight up on the winner. Ain’t that improvement? Once more: Look at our great array of Policioners and County Deficients, who have entrusted us with their lives, their fortunes and their sacred honors. Don’t they give up the jail keys valiantly and nobly; did they not a few weeks since with pistol and club arrest a powerful gang of marauders, put them in prison and save the life of an innocent criminal? Who cares for $1,500 reward? Then look at our defences! Don’t we keep a cannon, always loaded full to the ‘nuzzle, parading our streets from rosy morn to dewy eve, guarding the destinies of all good and worthy gin slingers? But this is not all, old bums! Look at our broad gouge railroads that President Don’t-know-who has built clean through our county and down among the switches and hazel brush to Stumpville, with only $300,000 and the right of way to help him. Look at our big brick depot, that we haven’t built yet nor never will. Look at our grand school houses for the edification of the hoodlums of generations yet unborn. Look at all these and say are we not mighty in ourmightiness? Then let the proud eagle squawk; let the great American Jack bray and proclaim in stentorian tones “Erin go unum, E pluribus Bragh.” Happy proud Squedunques the lightning of tarantula juice has yielded to your animosity, let not the temptations of mint juleps and sherrey cobblers seduces you from the paths of sobriety. Fare you well.